I wanted to upload my usual Wednesday post a day early so my Halloween special could actually be ON halloween so here it is! 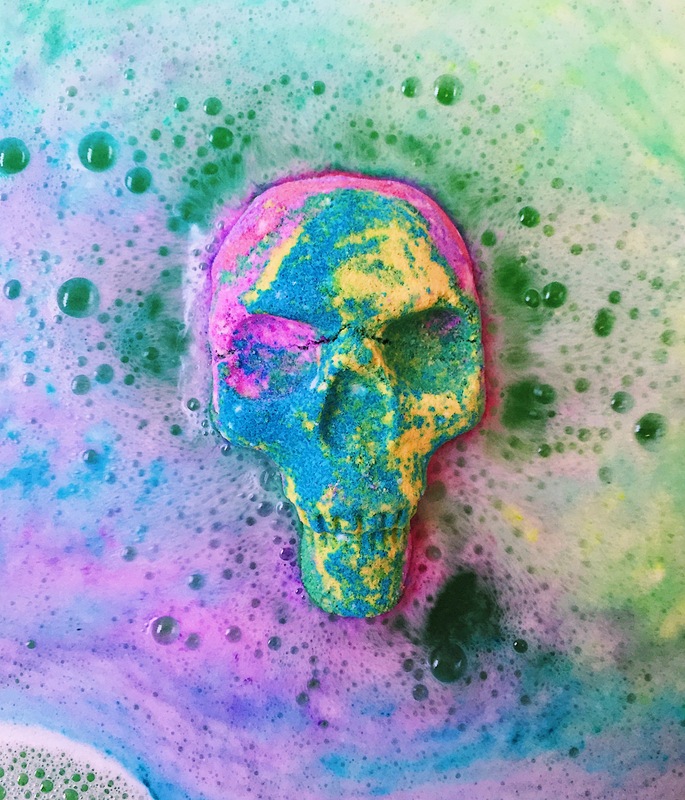 I’ve been searching for so long for somewhere in the UK that sells skull shaped bath bombs at less than extortionate prices, I’ve found so many amazing handmade products all over America but haven’t been able to justify shipping prices when they’re double the price of the products I want to order. 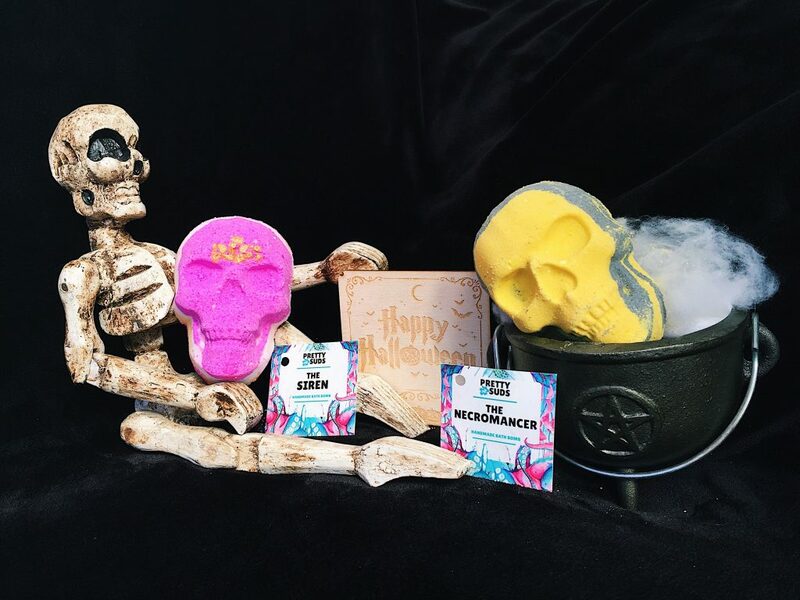 BUT I stumbled across the fabulous “Pretty Suds” Instagram page a few weeks back and fell head over heels in love with their skull and cauldron bath bombs and could not help but order every skull they had to offer and 3/4 of the cauldrons too. I think they might be just a halloween special although I really hope they aren’t as I would be ordering these babies all year round! Without further ado, let me introduce you to them. The Bogle is a lemony yellow and white, smells like sweet, sugary apples (this one is Jakes favourite) and contains super nourishing almond oil. 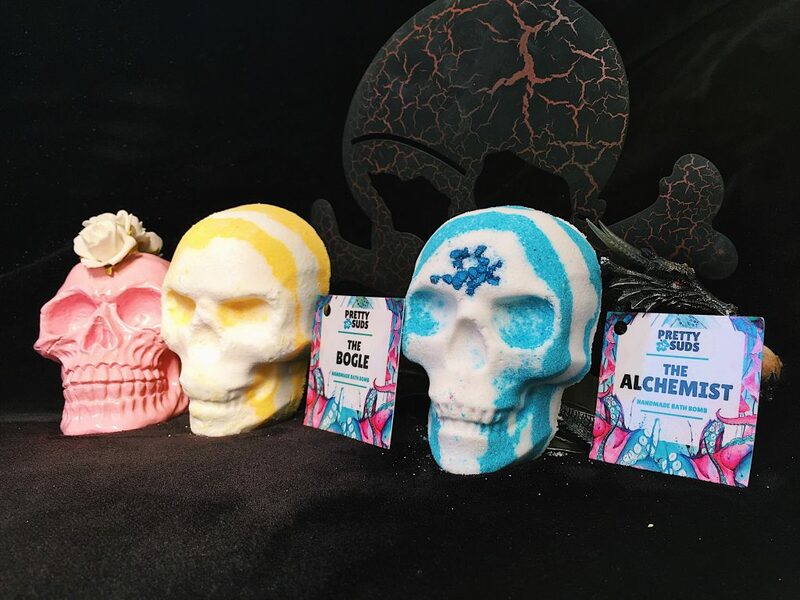 The Alchemist is a bubblegum blue and white and the scent is quite musky with a hint of vanilla – this scent has some real witchy vibes and it contains detoxing himalayan salt. 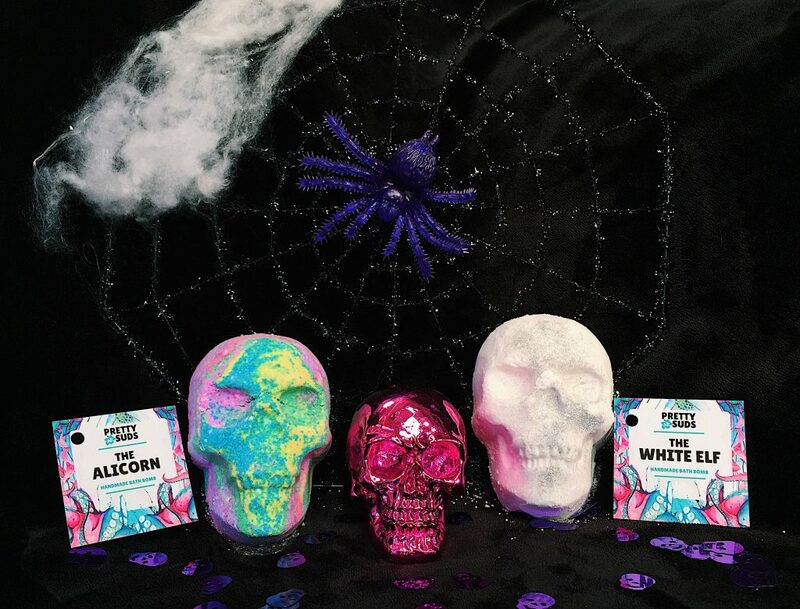 The Alicorn is all the colours of the rainbow and is a whole lot of different scents together to match it – a mix of berries, cream and vanilla like a big dollop of the classic eton mess but fruitier. The White Elf is plain white, covered in silver glitter and gives off a beautiful aroma of cherry and vanilla, this is definitely one of my favourites scent-wise! Sadly this one is super crumbly though and has fallen to pieces a bit :(. The Siren is a perfect pink and subtle yellow with a super sweet parma violet scent, this one has to be another of my favourites, this again contains detoxing himalayan salt. The Necromancer reminds me of electrical tape with its colours of yellow and black and gives off a tangy and sweet scent of grapefruit and vanilla. It contains charcoal which helps to draw dirt out of the skin. 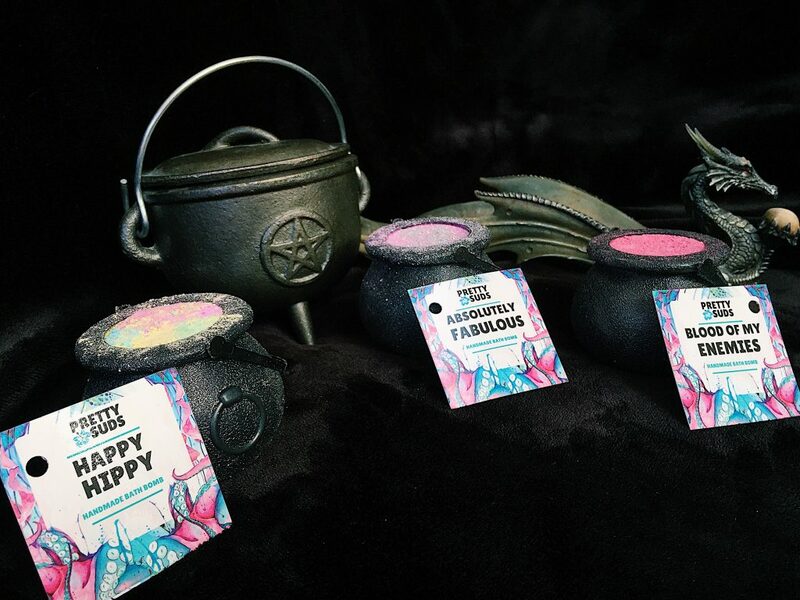 I’m sure you’ve seen the videos going round on Facebook of these fabulous things fizzing up out of the cute little cauldrons so these made me so excited to see just how they look in real life! Happy Hippy is a really fruity mango and papaya scent and is rainbow coloured (I’m really excited to see what colour this turns the bath! ), Absolutely Fabulous is berry scented and is fuchsia pink to match and covered in glitter and Blood Of My Enemies is another super witchy and musky/jasmine scent. So what did you think of this haul!? Would you use these type of products or are they not really up your street? It’s honestly going to take me a lot to use them as I can’t stop looking at how pretty they are. I’m going to be posting pictures, videos and reviews of them on my Instagram as and when I use them so you can follow me here if you’re interested! "Bristols First Free From Foodie Fest!" I’ve been so excited about this post! They look incredible, and I’m suprised at how reasonably priced they all still are?! The Alchemist is calling my name.. ? I cannot wait to start seeing you use them on Instagram, and I’m desperate to find out if they’re available all year.. ? Wow they look amazing! And great price too. These are so darn pretty! I didn’t realise skulls could be this pretty though. I love the colours and they all add a little something different to your bath. I think I might just have to check out Pretty Studs and see what else they have. I am definitely keeping an eye out on your Instagram to see these bad boys in the bath. They look so colourful! What a unique take on bath bombs. The scents sounds gorgeous too a lot different to the skull design! Perfect for halloween.. The alchemist and the white elf would be my sure choices anything with vanilla is just great. I also love the shapes they are far toooo cool! ?‍♀️ I love the pots in which they are pictured as well they are so witchy! ?? I love vanilla too! 🙂 thank you, they are just from the general decor in my room haha! Should I have a bathtub, I would hundred per cent use that kind of product but I don’t unfortunately :'( they look great though! Wow they look amazing very spooky and perfect foe Halloween and a great price as well. Oh my goodness I’m so glad you found some skull baths bombs! I saw you tweeting about looking for one ! The Bogle one sounds particularly lovely! These look amazing! I’m not quite a Halloween fan but these omg sooooooooo cute and beautiful. Now way! these are you all over!!! im definitely going to have to put an order in! they’re so well priced! These look so funky and colourful – I’d love a peace of art like them on my wall ! They look incredible! I’m not a big Halloween fan and don’t actually go out of my way to purchase Halloween products, but I do appreciate these babies! They look so colourful. And I understand the pain of finding products in USA but then the shipping prices are completely out of this world. I was looking for a pin of Pickle Rick for my boyfriend and the shipping was like 3 times as much as the price of the pin. wow these look absoloutely incredible and i would have thought they would have been so expensive but theyre such a good price! i may have to do a little shop! Wow these look so cool!! That’s definitely the struggle of finding/having cool looking things as you want to keep them looking pristine as long as possible! Honestly me too, they’re so gorgeous!